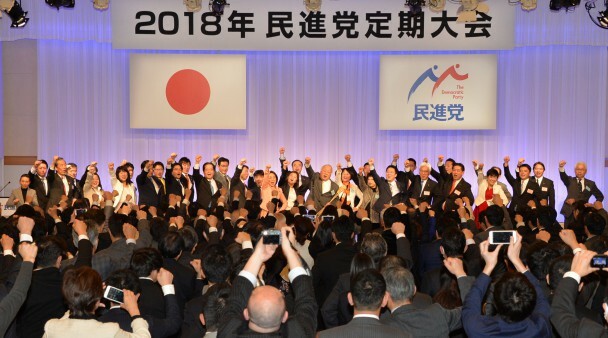 On February 4, the Democratic Party held its annual party convention for 2018 in Tokyo. Secretary-General of the Convention Organization Committee, member of the House of Councillors Motohiro Oono, declared the convention open. Ono went on to propose Nara Prefectural Assembly member Misato Ioku, Kinki Bloc representative of the female lawmakers’ network association, and Naha City assembly member Mao Shimizu, party representative for Okinawa Prefecture and member of the national youth committee, as joint Chairs of the Convention, and the two were approved unanimously by the floor. In his speech, President Ohtsuka stated that, following the convention, the party would accelerate preparations for both sets of forthcoming elections, putting into full operation a “Strategy Headquarters for the Nationwide Local Elections and House of Councillors Election” (tentative translation). These headquarters would first hold working level consultations with the Constitutional Democratic Party and the Party of Hope regarding members of prefectural assemblies and designated city assemblies in the run-up to next year’s nationwide local elections. It would also engage in operations moving toward the House of Councillors election, such as working to place unified opposition candidates in single-seat constituencies, avoiding doubling up of opposition candidates in multi-seat constituencies, and actively working on how to deal with proportional representation lists. Ohtsuka also stated that the DP would liaise with friendly parties regarding reform of work style, and aim to submit a counterproposal to the government legislation on this issue. He called for cooperation from the assembled participants, stating, “I aim to gather together like-minded individuals, and work to transform the DP as soon as possible into a new centrist party that will garner widespread support from the middle-class. In order to improve the lives of the Japanese people, we must be reborn as a “battle party”, one that can fight and win elections and is capable of holding the reins of government.